When a Wii-exclusive first-person shooter turns into an Xbox 360 game, it changes. What was first-person and four-player co-op was a top-down four-player shooter on the 360, when Kotaku played it at Game Developer's Conference last week. The transformation, from "weird Western" FPS to "weird Western" Gauntlet-style game was motivated by development studio High Voltage Software's desire to fill a genre gap on higher end consoles, The Grinder's lead game designer, Pat Dolan, told Kotaku last week. This higher-end Grinder will support four-player top-down battling. In the level I played, three other gamers joined me to shoot through waves of zombies and demons. Having not played Hunter, I was thinking more of a Marvel: The Ultimate Alliance kind of game. If you do as well, you'll have the right idea. Each of the characters can perform melee attacks, but the emphasis is on gunplay, with each player using their left analog stick to move and their right stick to aim, using triggers and shoulder buttons for mostly shooting and some melee and blocking. My trenchcoat-wearing hero had a default pistol and sub machine gun, but I swapped over to the guns that limited ammo: rocket launchers and flamethrowers, and other heavy-power firearms. Collecting crystals from downed enemies upgrades the guns. Other crystals restore health. The shift to this top-down action style of game is positive for The Grinder, in terms of producing a fun experience on the Xbox 360. I enjoyed shooting through enemies with three colleagues, landing the perfect shots in the nick of time or fleeing to the edge of the screen to regroup when the going got tough. We teamed up when we needed to and hogged the crystals when cooperation seemed less rewarding. The new Grinder experience doesn't feel deep yet, but given the planned Halloween 2011 release, there is plenty of time for High Voltage to add some wrinkles to the gameplay. What's less assuring is the fate of the Wii game. Dolan declined to comment on the status of that version, even when I pressed him to clarify whether it is or isn't still in development. He stuck to discussing the version we could play at GDC, saying it was High Voltage's best bet to expand into developing for next-gen consoles. 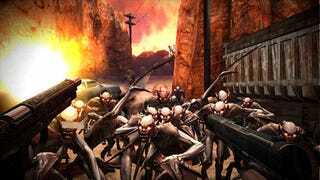 But given the mediocre sales of High Voltage's Wii-exclusive first-person shooter The Conduit in 2009, it's hard not to view the presentation of The Grinder in a radically different form on the 360 as a sign of shifting priorities at High Voltage. That said, the studio does have a Wii fighting game, Tournament of Legends, coming out through publisher Sega this year.